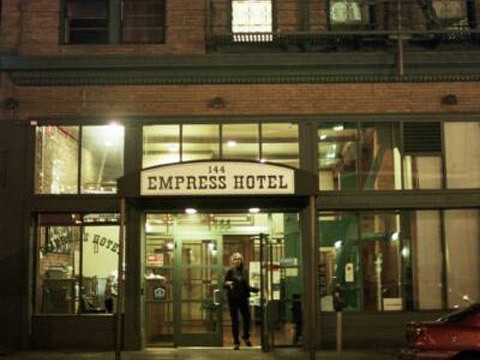 Empress Hotel is a documentary that reveals the human face of homelessness. The Empress, a ninety-unit permanent supportive housing model providing on-site social and medical services, is an environment where residents are able to take hard-won steps toward stability. The film gives unusual access into the everyday lives of those who fell through the cracks of the social services system, focusing on the stories of ten residents. Though similarly fraught by mental health, medical and substance abuse issues, these lives represent a remarkable diversity of experiences, socioeconomic backgrounds and personalities. This documentary creates awareness of a part of our society that is overlooked and fosters an appreciation of the tremendous challenge it poses to individuals, as well as the staff, who support them. Empress Hotel offers a rare opportunity to witness the daily struggles and rewards involved in beginning anew, creating community, and possibly transforming a life. Irving Saraf, winner of the 1991 Academy Award for Best Documentary Feature for In The Shadow Of The Stars and winner of the National Emmy Award for Dialogues With Madwomen, both with Allie Light, has a BA in motion pictures from the University of California at Los Angeles. He works in fiction and documentary film as producer, director, and editor with over 150 films to his credit, mostly made for TV. Saraf was founder and former head of the KQED-TV film unit and former manager of the Saul Zaentz Production Company. During his tenure with Zaentz, Saraf produced a score of films and was post-production supervisor of One Flew Over The Cuckoo's Nest. Allie Light, winner of the 1991 Academy Award for Best Documentary Feature and the 1994 National Emmy Award for best interview program, writes, directs, and produces documentary films with her partner, Irving Saraf. Light has published a book of poems, The Glittering Cave and edited an anthology of women's writings, Poetry From Violence. She lectured in film at City College of San Francisco and for ten years in the women studies program at San Francisco State University. She has also served on the media advisory panel for the National Endowment for the Arts and is a member of the Academy of Motion Picture Arts and Sciences and the Academy of Television Arts and Sciences.